Everyone likes choices, and that’s what you’ll enjoy with the Lenovo Flex 4 laptop line (known as the Yoga 510 outside of the United States). Lenovo announced this midrange model at Mobile World Congress in Barcelona on Sunday. Available starting in July, the Flex 4’s 11-inch models will start at $599. Bigger models with 14-inch displays will start at $699. 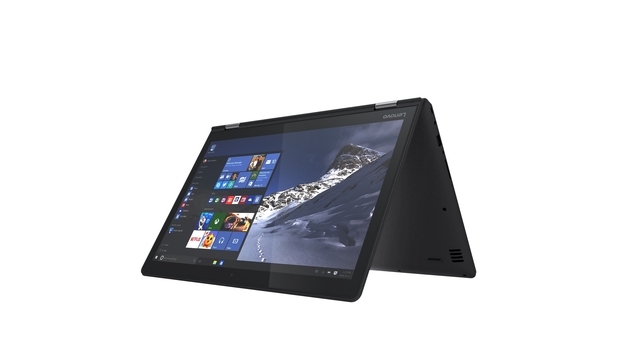 Lenovo offers many features and options on the Flex 4 systems. Not surprisingly, the laptops are on the heavy side as a result: 3.85 pounds for the 14-inch model, and 4.58 pounds for the 15-inch model. Within that bulk you get a Full HD, 1920x1080 IPS touch display, up to 8GB of DDR4 RAM, and up to 1TB of hard drive storage or a 256GB SSD. No matter which specs you choose, the Lenovo Flex 4’s versatile hinge lets you play tradtional or crazy with the form factor. CPUs start with a Pentium for the 14-inch model and go up to a core i7 on the 15-inch model. The bigger chip news, however, is the AMD discrete graphics option: You can get up to a Radeon M5 430 on the 14-inch model, and a Radeon R7 M460 on the 15-inch model. Batery life is very good, at about 8.5 hours per Lenovo’s tests. The only thing you don’t have a choice about is the 360-degree hinge. Lenovo says its users like the versatility, so the company is actually expanding this feature into other product lines. On the Flex 4, it’s just one more convenience on some pretty well-equipped laptops.